I left my apartment in Baridhara to go to one of my aunt’s home in Iskaton at a little after eight in the morning, and even in this residential, mostly quiet neighborhood I could sense the Eid. There were cows and goats tied to the gates of practically every villa and apartment building, many adorned with colorful plastic flowered necklaces. The poor cows. I can’t imagine bloodshed in my little neighborhood of otherwise peacefulness (though I am still waiting to run into Khaleda Zia who is reportedly moving into my street). I felt bad for the cows when we drove to Jatrabari, an area in southern Dhaka and I saw fat cows being driven on trucks, taken to homes on foot, etc. “Ei, koto holo?”, many who drove in their motorcycles past the cows would ask, and they would get an automatic answer from whoever led the cow. Apparently this is one of the fun parts of Eid, asking how much the cow cost from random strangers, and then boasting about it. At my Khalu’s (my aunt’s husband) family’s home this morning, I saw three cows that they had bought to be sacrificed. Theirs was an Australian kind, spotted and pretty huge. Kids from the building were playing around the cows, trying to get a reaction and then running away. We drove from Iskaton this morning to Jatrabari for a bit specifically to see the cow they had bought before eating it in about 27 hours. Do these cows know their fate? Listening to the comments around me all day were bizarre enough in my Western viewpoint- who is going to butcher it, is he good at cutting up the meat, did you get a good deal, where was it imported from, whose getting the stomach? When you spot a fat cow, it is either imported from India, or fed a lot of hormones (from India). 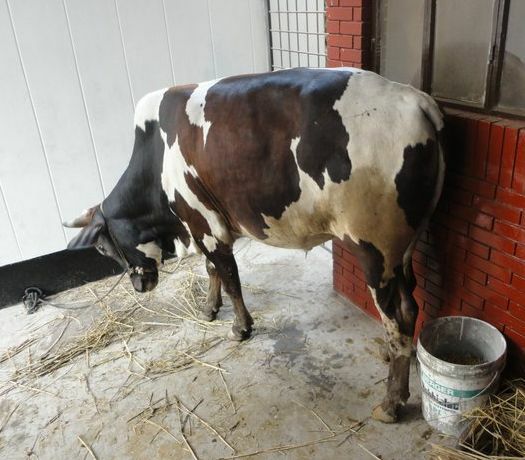 Bangladeshi cows are not fat. They are skinny and obedient, calm and slow. They bathe in the local pond, and sleep on dust. Australian brand cows are prized- their breeds are prettier, resembling a cow you might see in a milk carton with its black and white spots, fed good grass, heavyset, energetic, and for this country, exotic. So many cows. Tomorrow morning, Dhaka turns red with the blood, and the men of the families will get a chance to act like a bu tcher and participate in the holy day. Meat will be distributed around for days, and cooked in so many ways- curried, dried, fried, cooked for hours (bhunna), spiced and preserved, grinded into kebabs, the hoofs made into soups, liver pastes… piles of rice, pulao, and bread will await these dense dishes on the table for days on end. I remember coming to Eid when I was 11 years old and scarred from all of the blood and smell that filled the narrow alleys and roads. I had to shut my ears to not hear any noise. I mean, with so many cows, they are going to be looking around and seeing what is happening to their fellow beings. It is quite depressing. And I say this as I say that I love steak. In Saudi Arabia, where Eid has already happened today, my dad had to go to one of the centers and wait in line to see our cow being butchered. They do not allow public butchering like in Dhaka- for sanitary purposes. My dad gave up after a while though because the line was so long. I mean, we are talking about a country where most people can afford their own cows, compared to Dhaka where many families share in on a cow and a few goats.